Keep reading for a super duper BOGO offer! 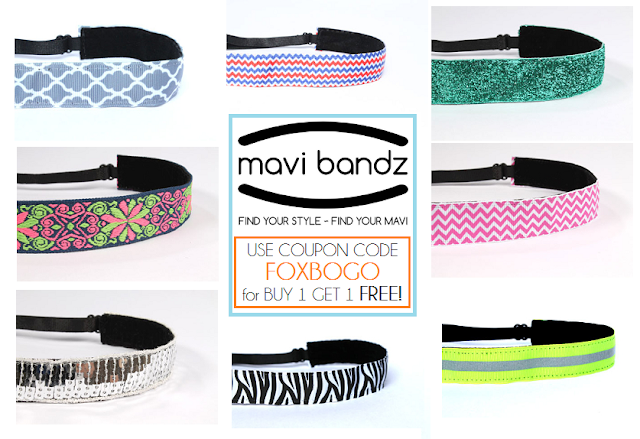 I have so much to say today, but one of the things I am most excited to tell you about is our new sponsor, Mavi Bandz! If you are a loyal reader, you already know of my obsession with Mavi Bandz, and it is even stronger now that we have partnered up with the lovely Jordan, creative genius extraordinaire behind the idea and company! If you haven't heard of Mavi Bandz..let me just fill you in. You know how annoying it is when those elastic headbands slip off your head five minutes into a run and you end up having to hold back your bangs for the next 30 minutes until the sweat kicks in and sticks them to your head? Well...Mavi Bandz solves that. Seriously. Over the years I tried every freaking elastic headband out there, and whether I was exercising or just sitting around the house (usually the latter), they would always slip off and end up around my neck. I was sure I had a weird shaped head or something, but the more I talked to other women, the more I found out that just about everyone was having the same problem. Then came Mavi Bandz. I ordered my first one a few months ago, and you rarely find me not sporting one these days. They are the only non-slip, adjustable headband out there...so they fit perfectly (no headaches!) and will not, I repeat..WILL NOT...slip off of your head! Plus they are actually cute and come in a zillion styles/designs that are good for a ton of different occasions...not just athletics. My current faves are this red, white and blue chevron one (hurry up Fourth of July! )...perfect for FC Dallas games...and this gray quatrefoil print...great for everyday with jeans and a cute top. The best part? They totally make up for the fact that I never have time to actually blow out my hair anymore. Okay...maybe that isn't the best part, but it is certainly a huge plus! Here I am a few months ago with my first band..and when the addiction began! Anyway...I could go on for hours about their greatness, but I will let you find out for yourself. You can just go ahead and thank me now :) Speaking of thanks...a huge thanks to Mavi Bandz for giving Sweet Orange Fox our very own coupon code to pass along to y'all! Use the coupon code FOXBOGO for buy one get one free. Yep...you read that right! Get a couple for yourself and a couple of FREE ones as a gift (or just keep them all for yourself). 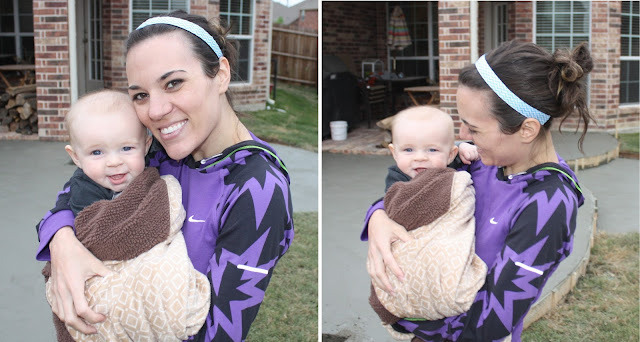 I didn't even know they had this neon reflective running band yet, but I am going to buy it RIGHT now. And I think I'll have to get the orange one as my BOGO. Hope everyone is having a fantastic Father's Day weekend so far! And don't worry...it's not too late to put together a few of these gifts for Dad! So...which Mavi Bandz are you going to be rocking this summer?? This entry was posted on Saturday, June 15, 2013. You can follow any responses to this entry through the RSS 2.0. You can leave a response.